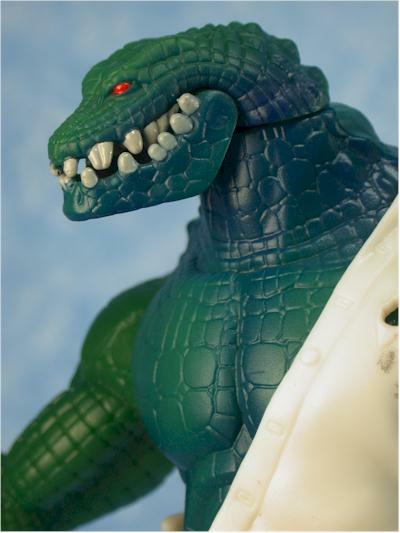 Mattel got slapped around a lot this year in the Best and Worst picks for 2003. Worst company, and runner up for worst articulation, you might wonder if they do anything right. I once heard that the definition of a mixed blessing was your mother-in-law driving off a cliff in your brand new Cadillac. If that's the case, then the Mattel Batman line has been a mixed blessing. With some great sculpting and character designs, they've been well received by fans - when they can find them. Shortpacking popular figures and throwing in impossible to find variants boosted Mattel in the voting for Worst Company. 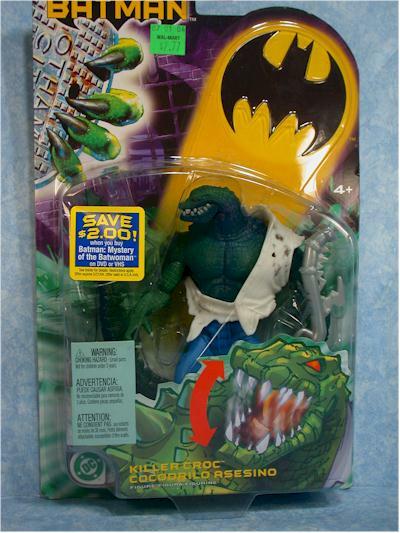 Killer Croc is one of those tough to find shortpacks. At one per case of the third assortment, he spends little time on the peg. And since many stores never even put out the second wave, finding him at retail has been even more difficult. If you do get lucky - your best bets are Target and Wal-mart, and they've just started to show up at Toys R Us - you can expect to pay around eight bucks. The cards are pretty basic, although this wave was updated for the Killer Croc theme. It's funny that every figure in this wave, along with every new Deluxe figure, has this 'croc style' packaging, and yet the character it's all based on is one per case. 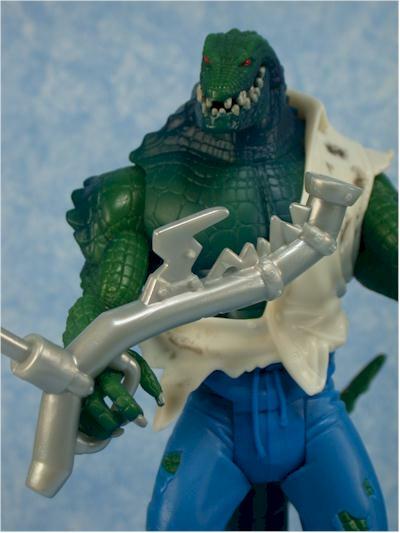 Croc's tail comes packaged behind him, and can be attached pretty easily once it's removed. It's a little tougher to get off once it's on though, so you should decide if you want to have it on or not before popping it in. If I were to rank the best characters in this series so far, I'd give Zipline Batman and Mr. Freeze four stars for sculpts. 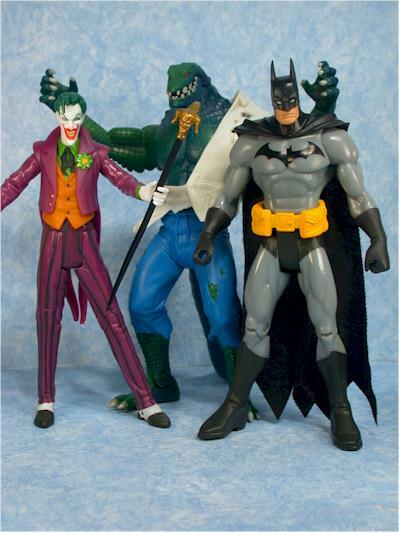 Both the Joker and Killer Croc fall slightly behind them, but just slightly. 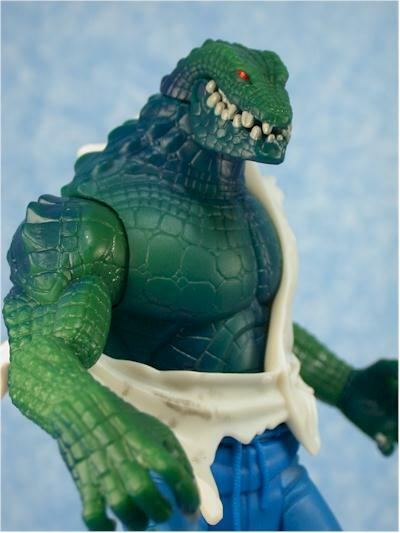 The style of Croc might not be everyone's idea of a perfect design, but you can't fault them for trying. 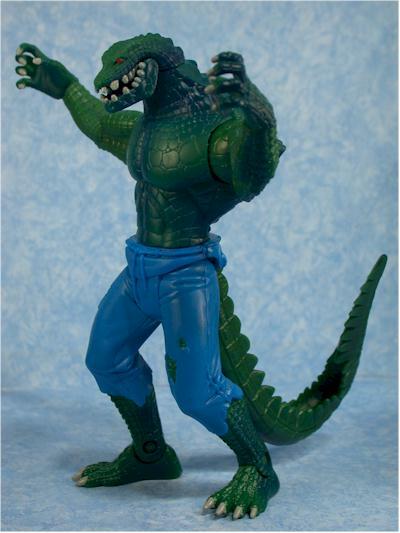 They decided to go with a look that's more Croc than man, especially in the head. The head is also somewhat small in comparison to the body, but I found that the look grew on me the more I looked at it. This overall look is much more animated than I'd expected - less detail in the clothing for example - but this line has never been really Mcfarlanesque. Too much detail, and I'm not sure he would have fit in as well with Bats and the Joker. I've heard some complaints about the tail, but I thought it looked great, and snapped on nice and tight. The paint ops are a little disappointing, but not surprising. The eyes and teeth are done well, and the clothing, while basic, is clean and consistent. 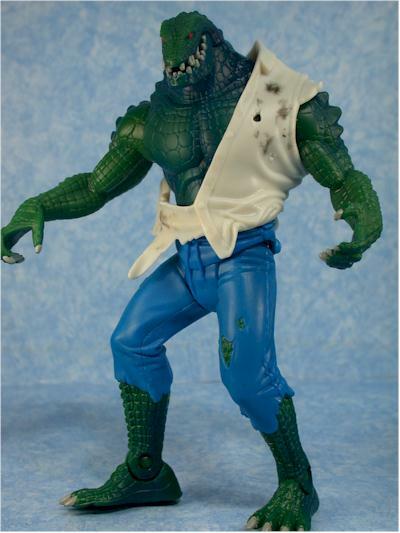 But this Croc suffers from a problem that many bare chested figures have - mismatched colors. The torso and arms are made from different plastics, and the dye takes slightly different to each. These pieces are cast in the green, and then have some painted highlights. The casted color though doesn't quite match up, and it's fairly obvious. I didn't hit him up for this as much as I usually would though, because it's not as bad as some cases we've seen. The highlighting helps disguise some of it, and if you're not paying close attention, you might not notice right away. It's certainly not as distracting as it could have been. The articulation isn't amazing, but it's sufficient. There's neck, ball jointed shoulders, waist, hips, wrists, and ankles. He can stand fine on his own, and you have some options with the arm poses. He also has a jointed jaw that has a spring action, and counts as his 'action feature'. It's nothing spectacular, but it gives a little boost in the Fun Factor. And let's not forget that tail! It's bendy, and can hold positions pretty well. There's only one - a weirdly bent pipe, colored a very 'toy' gray. It's not much to write home about, and it's unlikely you'll include it in your display. You could also count the shirt as an accessory I suppose, since it is removable He actually looks pretty good either way. When I was a kid, this was my kind of toy. Decent enough articulation to have fun, he stands on his own easily so I wouldn't have to dink around with it, and he's the perfect bad guy to Batman. Figures like this are proof you can please kids AND collectors. At $7 - $8, you're getting pretty much the industry standard. As the price goes up from there - if you're stuck getting him off ebay - the value score drops drastically. I almost gave this figure another half star - almost. It's a solid action figure, with better than average sculpting and a good design. Had the accessory(s) been slightly better, that would have moved this green guy to the next level. As I mentioned earlier, your best bets are Target and Wal-mart right now. You'll recognize the rest of the wave, because they all have the new card back. KEEP SCROLLING DOWN FOR A COMPARISON PHOTO!